Beach volleyball is a relatively new sport, dating back to 1915 in Hawaii. My first memories of beach volleyball are from the late 90’s. I remember watching tournaments on TV when the Cuban women were consistently crushing their opponents. 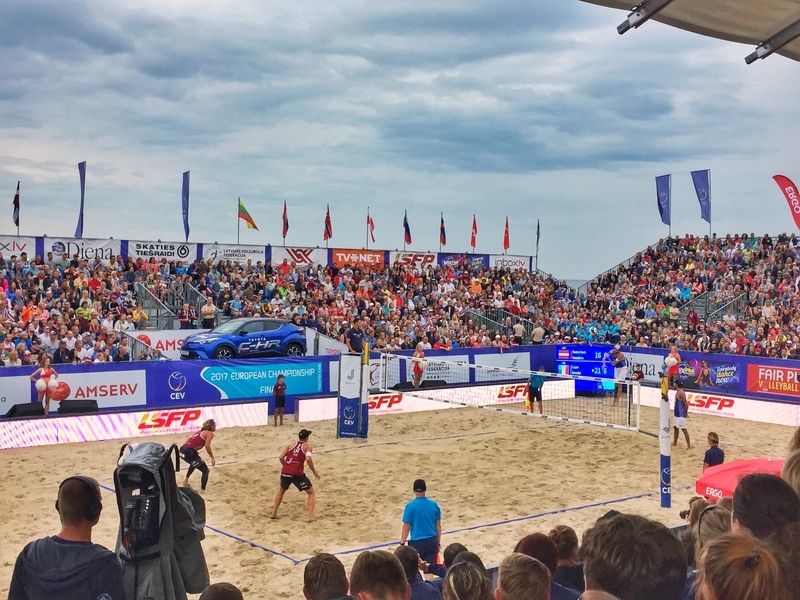 I’ve never had much to do with beach volleyball, but after watching the CEV European Championships in Jurmala, Latvia recently, I want to watch all the beach volleyball comps. This tournament was so fun. While the crowds aren’t ever going to be massive, the happiness surrounding the tournament area is addictive. The 3000 seat temporary stadium had an electric atmosphere. The 12,000 seat stadium at the Rio Olympics must have been next level crazy. The following are parts of the recipe that creates the awesomeness of a beach volleyball tournament from my brief experience. It’s not called BEACH volleyball for nothing. 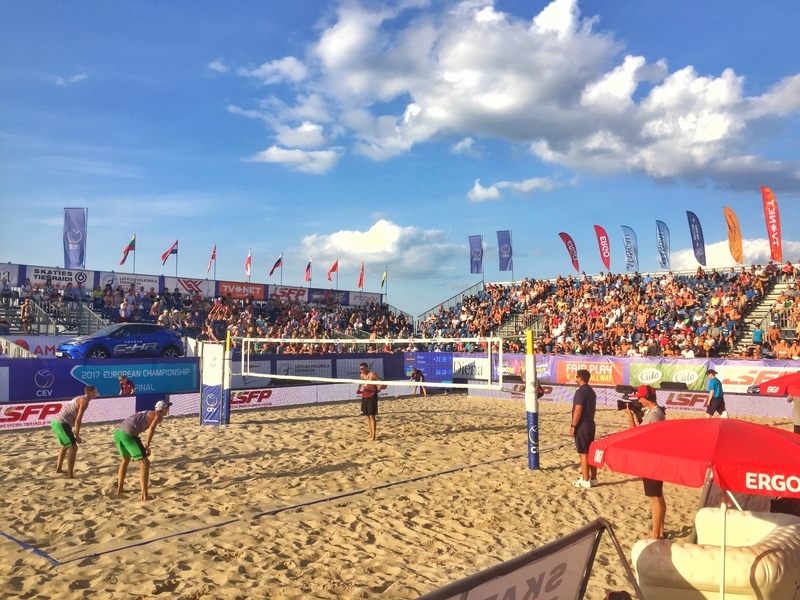 Not every tournament is held on the beach, but you can be sure there is a beach vibe at the ground which is associated with nothing but good vibes! 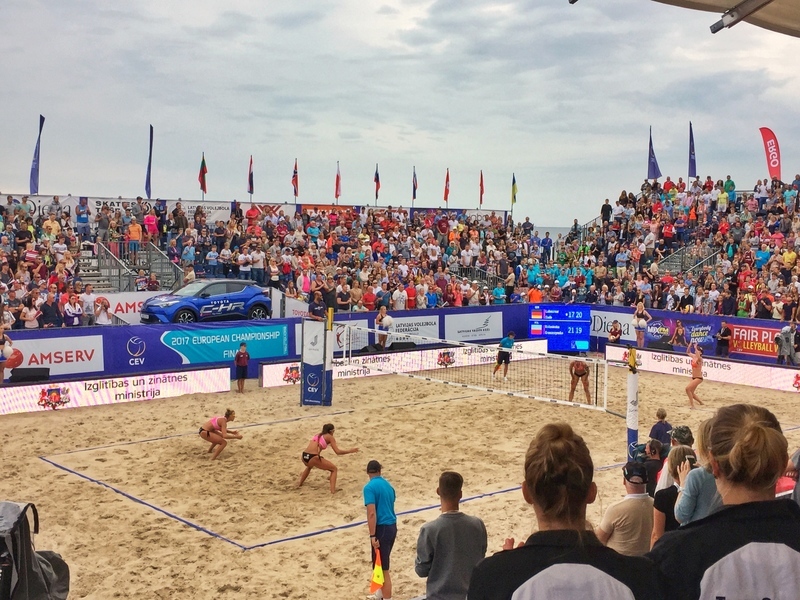 Apparently playing competitions on natural sand isn’t a norm, making Jurmala tournament extra exciting for the players. The rallies in beach volleyball are like the awesome rallies you see in tennis from time to time. As respectful as the crowds are, some rallies generate cheers mid rally when a miraculous save to keep the ball in play happens. It only adds to the drama. There’s nothing more satisfying than sticking your hand out in desperation to then feel the perfect connection to stay in the point. Watching that is a close second. It doesn’t matter if you’re familiar with beach volleyball or not. The game is simple. Rather than me attempting to explain them, check them out here. The MC is massive in beach volleyball tournaments. Between each point, (awesome) music clips run for 10 – 15 seconds and the guy behind the mic would usually make a small piece of commentary about the point and game situation. This keeps the crowd involved and made sure there was no lull between points with some humour thrown in from time to time. After each point, team mates would acknowledge each other. The usual form was a simple tap of the hand, but some teams had elaborate handshakes and hugs they’d do after winning a point and usually even if they lost the point too. Looks like bending the knees is important! In a world where equality is getting better. Slowly. But surely. Beach Volleyball is playing its part. Both male and female tours received the same prize money at the European Championship and there was just as much interest in the males and females games (though in this case the mens final was by far the most popular because of the homegrown team playing in the match). There is nothing more satisfying than diving across that ground know the sand is going to absorb your fall. Somewhat. I’m a big diver (in most sports, but not for faking an injury). Even tho I recover 1 out of 15 shots when playing, it’s so satisfying. The pros like diving too. They somehow manage to do it with a lot more grace and save a lot more shots. They’re an instant crowd pleaser too. 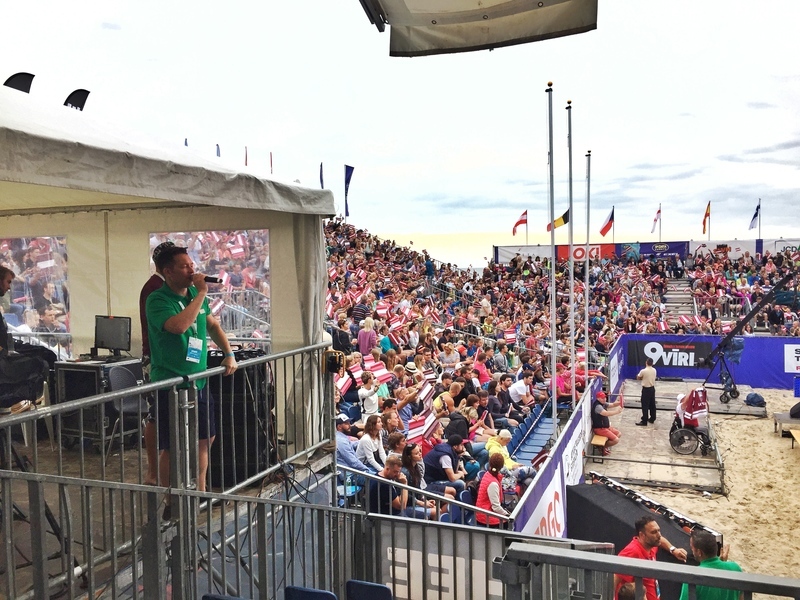 The cozy atmosphere (~3,000 seats at the Jurmala main stadium) allows the MC to get the crowd involved. There were both mexican waves and random chants started on a whim. I mentioned the MC featuring in between each point earlier which you may think would get annoying. It didn’t though as it preventing awkward silences in between points which would make the atmosphere flatten not only for the fans, players too. There’s nothing worse than watching a stop start game. Maria Sharapova has always been given stick for taking her time between points (awesome interview where she addresses that here). NFL to me is the worst offender and going back to my favourite sport, rugby league, the games are always better when the action flows non-stop. The Latvian lad above is known as ‘The Lion King’ a.k.a. Aleksandrs Samoilovs. He was by far the most popular player for obvious reasons, but he helped the crowd get behind him. 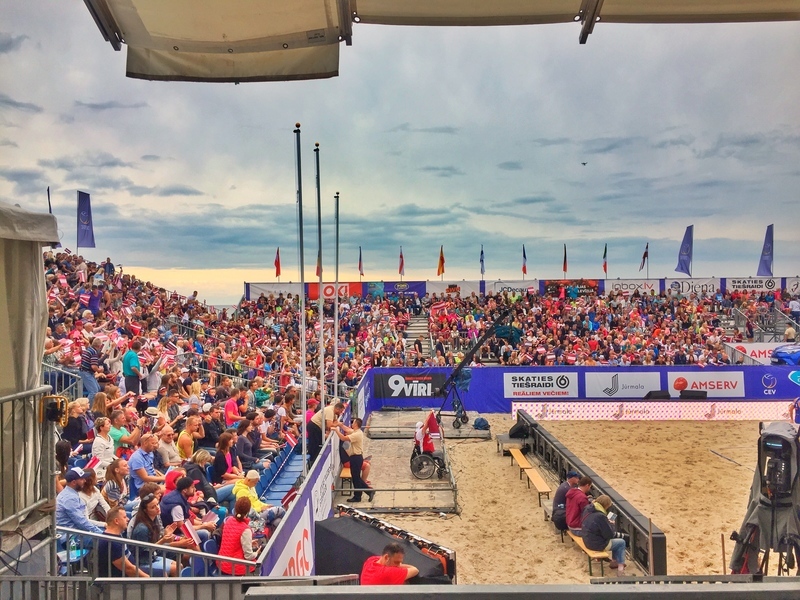 From what I could tell, there were some other players who were real characters and really just love playing beach volleyball and appreciated people coming to watch them. If you’re a youngster, there are some moments that are priceless growing up. Being able to play on the same court or field is one such occasion. 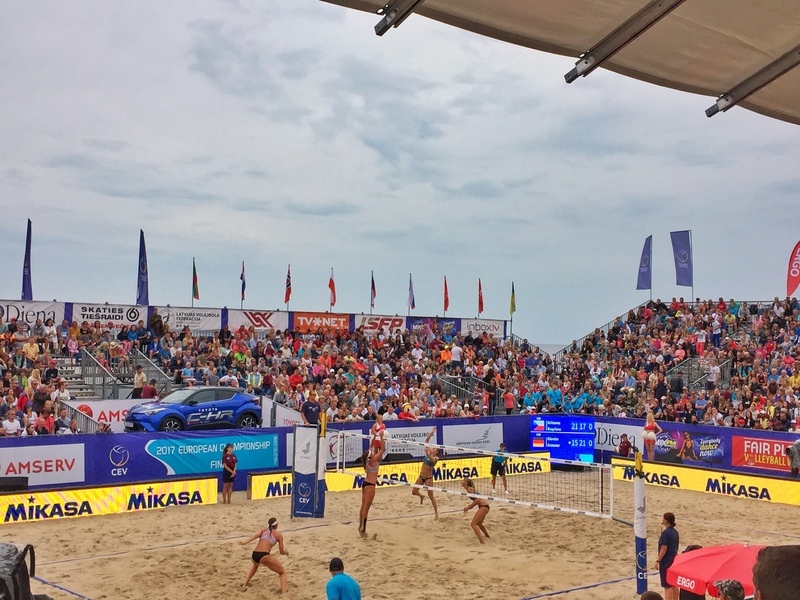 While the big stadium is one volleyball pitch, there were half a dozen or so beach volleyball courts along Jurmala Beach where matches were played on earlier in the tournament. As teams were eliminated the majority of matches were now played in the arena. Yet the nets were left up on the outside courts for anyone to use. I’d have loved to have played on there. If I had friends. Of course, this is had to turn into a 10 ingredient list. But there you have it. I was actually surprised how much I enjoyed my time at the tournament. You will too! 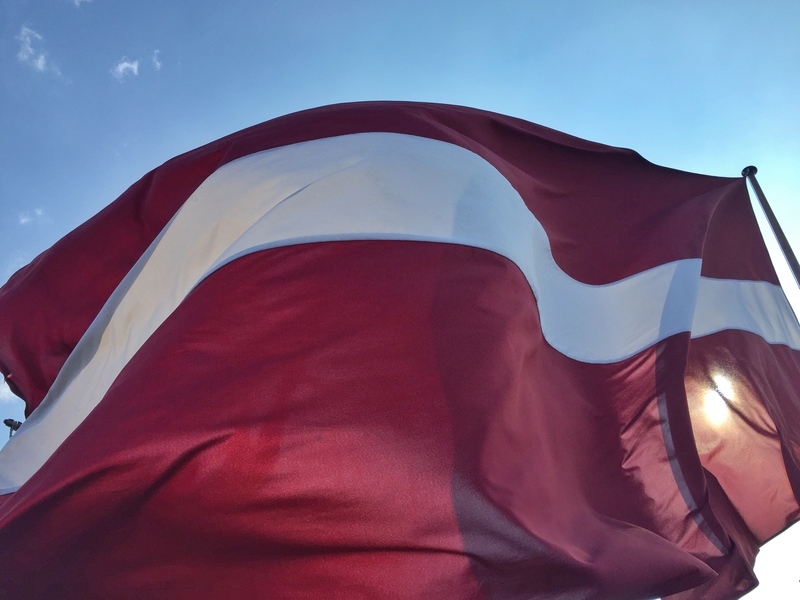 Unfortunately, Latvia took home the silver medal home in the men’s final with Italians winning. On the women’s side, Nadja Glenzke and Julia Grossner from Germany took the title.